There are two types of bread pakoras available, one type is where bread slices are just dipped in Chickpea flour batter and deep fried. 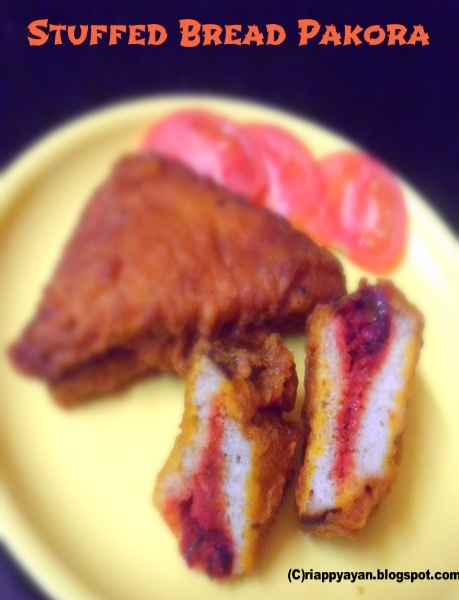 Another version is vegetable stuffed bread pakoras, where mashed vegetables or cheese are stuffed between two slices of breads, then dipped in batter and deep fried. Usually I make the first version most often with my evening tea, but this time I tried this stuffed version. The most common filling is made with mashed potato or cheese, but you can prepare your choice of filling. You can serve these to your kids for a filling and healthy evening snack and it's an all-time hit accompaniment with tea. The stuffing or filling I made with mix-vegetable for a healthier and filling evening snack for kids and family. Black cumin seed : 1 tsp. For the filling : Boil all the vegetables till just done, keep aside. Heat oil in a pan, temper with black cumin seed, turmeric and red chilli powder. Then add boiled vegetables and mix well. Season with salt and keep aside to cool. Prepare the batter : Take all the ingredients in a bowl, mix well and then add just enough water to prepare a semi-thick batter, so that it can coat the bread slices well. Keep aside. Now take the breads, take out the side crusts from all the breads. Add prepared stuffing on one slice of bread and put another bread over that like a sandwich. Now cut the sandwich diagonally. So, you will get two bread pakoras from 2 slices of bread. 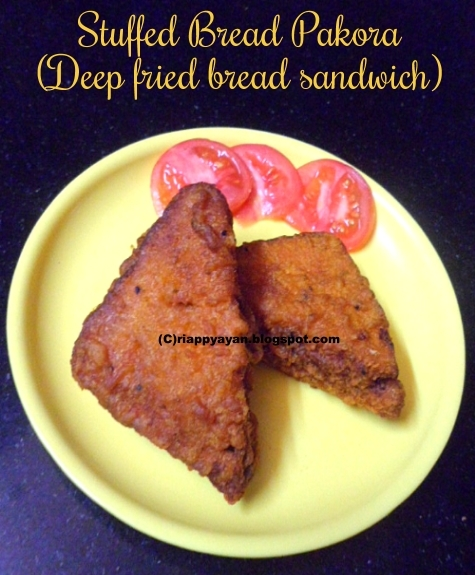 Similar way, make other bread pakoras. Meantime, heat enough oil to deep fry in a pan. The oil should be not too hot, not too cold, keep the flame in medium. Slowly put bread pakoras into the oil, do not overcrowd the oil. Fry till both sides are deep brown in color. Your yummy bread pakoras are ready. I have completely forgotten about stuffed pakoras and you are tempting me here Indrani..makes me hungry. Delicious and crispy pakoras. Looks wonderful. Love this one, makes a perfect snack. wow yummy pakoras... u made me so tempting now..
My fav evening snack..love it.